EU Law Analysis: Accountability and Independence of the Governors of National Banks: Any role for the Court of Justice of the European Union? The European Union (EU) has long been criticised for administrative inadequacies and for structural deficiencies. There have been a number of reports and commentaries highlighting that the EU suffers from political irregularities. Similarly, alleged corruption, maladministration and money laundering at the national level of governance, as shown below, is of equal concern for the citizenry and the Union alike. On 26 February 2019, the Court of Justice (Grand Chamber) gave a significant judgment on two joint cases brought by the suspended Governor of the Central Bank of Latvia, Ilmārs Rimšēvičs, and the European Central Bank (ECB) against the Republic of Latvia. Mr Rimšēvičs and the ECB argued that the Latvian Anti-corruption Office has unlawfully prohibited him from carrying out his duties as the Governor of the Central Bank which included participation in the Governing Council of the ECB. Rather unexpectedly, the Court of Justice annulled, for the very first time in the history of EU law, the national act from the Anti-corruption Office which restricted Mr Rimšēvičs from exercising his duties. This judgment raises broader constitutional ramifications. It is therefore necessary to examine whether the Court has now gone beyond the jurisdiction set out in the Treaty framework. With all due respect, the ruling comes as a big surprise. This commentary examines the appropriateness of the recent judgment and concludes that the Court of Justice has stretched its powers of judicial review unprecedentedly. Yet, it can be set at the outset that the Court’s ruling is exceptional and closely related to the EU’s monetary regime. It remains to be seen whether this rather extraordinary case will mark the beginning of a new judicial trend with extended jurisdiction well beyond the EU legal order. Mr Rimšēvičs, the Governor of the National Bank of Latvia, was accused of soliciting bribery in the form of a free leisure trip as well as accepting the amount of EUR 750 000 in exchange of exercising influence in favour of a private Latvian Bank. The Latvian Anti-Fraud Office initiated investigations into the serious bribery allegations which resulted to the imprisonment of Mr Rimšēvičs. 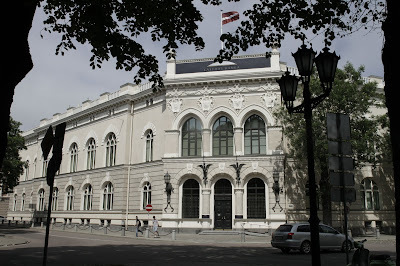 On 19 October 2018, he was released following a prohibition on performing decision-making, control and monitoring duties within the Central Bank of Latvia. Mr Rimšēvičs and the ECB challenged the legality of the decision to relieve him from the office before the Luxembourg Court. The Court annulled the decision of the Latvian Anti-corruption Office to the extent that it has prevented the Governor of the Central Bank to exercise his EU (and national) duties. A Governor may be relieved from office only if he no longer fulfils the conditions required for the performance of his duties or if he has been guilty of serious misconduct. A decision to this effect may be referred to the Court of Justice by the Governor concerned or the Governing Council on grounds of infringement of these Treaties or of any rule of law relating to their application. Such proceedings shall be instituted within two months of the publication of the decision or of its notification to the plaintiff or, in the absence thereof, of the day on which it came to the knowledge of the latter, as the case may be. The Treaty on the Functioning of the European Union (TFEU) provides for two different methods of judicial control designed to ensure the legal exercise of power by EU institutions, offices, bodies and agencies. The relevant provisions are Articles 263, concerning direct actions for annulment, and 267, concerning indirect review via the preliminary reference procedure from the national courts. Overall, the EU system of judicial review reflects the fundamental principles of subsidiarity provided in Articles 4 and 5 TEU. Consequently, the annulment of a national act falls within the exclusive competence of the Member States and the CJEU has jurisdiction to annul a national measure only where there is an explicit power to do so in the Treaties. Rimšēvičs is therefore a unique case as it is relates to the annulment of a national measure by which the Governor of the national bank of Latvia was “relieved from office”. It becomes pressing to examine the appropriateness of the Court’s ruling and to assess whether EU law explicitly empowers the CJEU to annul the national measure adopted against the central banker. The CJEU ruled that it has jurisdiction to annul a national measure so long as it suspends the Governor of the national bank. In doing so, the Court interpreted that “both the literal and the systemic and teleological interpretations of Article 14(2) of the statute entail the action provided for in that Article being classified as an action for annulment” (para 66). The Court went even further to explain that the statute of the ESCB derogated from the usual distribution of judicial review powers between the national court and the EU courts. The justification, according to the Court, was that the “ESCB represents a novel legal construct in EU law which brings together national institutions, namely the national central banks, and an EU institution, namely the ECB, and causes them to cooperate closely with each other, and within which a different structure and a less marked distinction between the EU legal order and national legal orders prevails.” (Para 69). In Rimšēvičs the Court clarified the abovementioned provisions as regards independence and accountability of the Governors of the National Banks. Surely, any failure by an individual Governor to meet the standards described in Article 14 (2) ESCB, as set out above, can lead to a significant damage of the public image of the ECB and consequently cause a significant damage to financial stability in the EU. One can understand that the concerns and commitment to high standards exercised by the Latvian Anti-corruption Office are perfectly legitimate. Yet the Latvian authorities were asked in a number of instances by the Court to support their serious allegations with evidence. The failure to produce any evidence supporting the suspension of Mr Rimšēvičs from office is remarkable. The lack of evidence against the serious background of alleged bribery and money laundering is related, closely, to the fact that individual Governors need to operate impartially and independently, without influence and pressure from external sources, whether national governments or private individuals. The Court protected the independence of the ECB and its Governing Council and emphasised, rightly, that under EU law any form of pressure cannot be accepted. Overall, the Court highlighted that independence should be protected under any circumstances in order for the Governor and the ECB to adopt and implement their decisions based upon technical and up-to-date scientific expertise. They adopt critical monetary related decisions that will have little or no use if they are subjected and influenced to any pressure. The Governors must meet the highest possible standards and should perform their duties without any external influence due to their high ranking. In particular, as already explained above, Article 14 (2) ESCB requires Governors to be free from any external influence. This point is vital if the ECB is to stay independent of Member States or individuals. But let’s assume for a while that there was enough evidence that Mr Rimšēvičs obtained pecuniary advantages from the Latvian private bank. Assume further that the Latvian Anti-corruption Office concluded that the Governor needs to be held accountable for infringing his duty to behave with integrity and avoid maladministration. Is the national procedure that relieved him from the office in accordance with EU requirements to respect the rule of law? Or, does it represent an abusive behaviour exercised by the Latvian executive authorities? Relieving the national Governor whose independence is protected under EU law without evidence and without given the opportunity to see and respond to concrete evidence that supports the serious allegations constitutes a manifest violation of the notion of independence which is clearly safeguarded by the ESCB statute. Surely this is not something that can be accepted or justified. Anything that compromises the independence of the national central bankers is illegal under EU law. Pursuant to the EU Treaties, clearly the Court of Justice has jurisdiction to decide on cases related to the accountability and independence of the ECB. Yet, the interpretation of the Court to extend its power to annul a national decision is surprising, at least. Taking into account the absence of any evidence and also the factual background of the case, one can realise that a number of irregularities by the Latvian authorities took place. The Court has made the right decision in clarifying the set EU law requirements that shield the ECB and the ESCB from any pressure. Additionally, and perhaps most importantly, the judgment provides us with clear boundaries on how to safeguard the independence of the national Governors. Independence has been a key factor in deciding Rimšēvičs, a factor which came with the cost to strike down a national decision by the CJEU in order to safeguard it.